"There are no heroes anymore, Bishop. 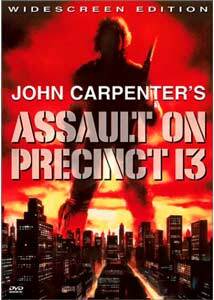 Just men who follow orders"
Assault on Precinct 13 is John Carpenter's "lost" film. His first feature, the sci-fi black comedy Dark Star, is a cult favorite around the world, and his first post-Assault film was the now legendary Halloween. As a result, Assault is often left off of his filmography, but it remains one of his finest films. Produced on a very low budget and a tight schedule, this modern-day remake of Rio Bravo showcases all of Carpenter's strong points as a director and writer, while still providing basic, visceral thrills that even a casual filmgoer can appreciate. Carpenter still ranks as one of my favorite directors (despite the extremely weak films he's recently been involved with) and this movie reminds me why. His knack for intensity, memorable characters, and a solid visual style meshes perfectly in this film, and now that a respectable DVD edition is hitting the market, there's no excuse not to celebrate. Set in an unnamed city, the story begins with the brutal deaths of six teenagers at the hands of police officers. The teens, part of a deadly gang known as 'Street Thunder', had been stealing heavy arms and forming an arsenal for some sinister use. Unfortunately, the deaths trigger an even more intense reaction from this fanatic gang of violent thugs, and the city can feel something going on below the surface. Police Lieutenant Bishop (Austin Stoker) begins his day hoping for a good assignment, but instead, he's given the job of last Lieutenant to oversee Precinct 9, a decaying police station that's being retired in a matter of hours (and no, the film's title doesn't match the actual precinct—probably an error by distributors). When he arrives, he discovers only one officer and two secretaries on duty. There is no equipment, no firearms, and power and phone service are to be shut off in the morning. At the same time, the Street Thunder gang decides to make a violent end for themselves—a suicide pact, if you will. Additionally, two death-row inmates are being transferred across town, including the infamous murderer Napoleon Wilson (Darwin Joston). When their bus has to make an emergency stop, they end up at Precinct 9. Before long, the Street Thunder gang is laying seige on the Precinct building, which is now without power and phone lines. The cops cannot get out, as the gang has access to machine guns and sniper rifles, and they have barely anything to arm themselves with. Like brainless zombies, the gang simply kills and wages war blindly and without fear of death, but also with strategy. Doing their best to cover up the visual evidence of their crimes (as well as the noise), the gang manages to stay undetected, even with police cars patrolling the area. Without outside help, Bishop and the inmates in his cells must all work together to figure out a way to survive the death trap. The result is tension-filled, engaging cinema that's expertly handled by Carpenter. While all of the actors are superb in their roles, perhaps the best aspect is the absence of true characterization of anyone in the Street Thunder gang. Like faceless robots of death, they simply keep coming. While this extremely black-and-white portrayal of the good guys and bad guys might seem a tad unrealistic or perhaps undesired nowadays, it works perfectly to create suspense here. These guys are simply evil. As a result, the struggle to hold them off until help arrives feels intense and truly believable. Of course, contributing elements include Carpenter's distinct visual style (the man knows how to use a 2:35:1 aspect ratio amazingly well in thankless, dialogue-only scenes), wonderful cinematography, and of course, Carpenter's minimalistic synthesizer score. He openly admits to wanting to capture the feel of a traditional Western, as well as paying homage to the intense, gritty films he loved growing up (mostly Italian Westerns), but his own touches are pretty original. He uses the modern setting very well, evoking a feel of terror and horror rather than all-out action and adventure. Gripping to the last, Assault on Precinct 13 uses every ounce of it's combined talent to the maximum. It is a masterpiece of the thriller genre and an example of low-budget filmmaking at its purest. Image Transfer Review: Despite a bit of grain here and there on the original print, this transfer is extremely impressive and actually allows the viewer to enjoy the style, cinematography, and visual flair without any of the problems many previous releases had. The color is much better, as is the black level (which had a tendency to be badly unbalanced, thus washing out the picture, which is primarily filmed in darkness). I detected no edge-enhancement, shimmer, or other flaws normally associated with older films on DVD, and the compression seemed solid enough that even the most challenging scenes were free of significant digital errors. The source has a few flecks and scratches, but nothing of any major note. Audio Transfer Review: The film is presented with its original mono soundtrack expanded into 2 channel. For a mono soundtrack, it packs a surprising punch and is given a considerable amount of room to move in. Nothing sounds harsh or tinny; gunshots are abrasive and bassy while the synth score and dialogue remain fully rendered and without distortion. Extras Review: The disc features some decent extras that help give this classic some new life. First up is a full length commentary by John Carpenter and actor Austin Stoker (who plays Lt. Bishop). It's a fairly relaxed, but informative, complete with tons of behind the scenes anecdotes and such. Stoker reflects on his role and how, at the time, he suspected the film probably wouldn't be terribly successful and that Carpenter may not have ever moved on to anything else. Definitely worth a listen, as are most of Carpenter's commentaries. Elsewhere on the disc is footage from an interview Carpenter and Stoker gave to an audience at Los Angeles' Egyptian theater. Although it isn't set up very much, it appears that the pair were presumably interviewed before or after a special showing of the film, as the audience is unquestionably full of rabid fans of the flick. It's sort of like a condensed version of the commentary, but still worth watching. The original trailer is presented along with some radio spots (remember radio spots for B-movies? ), helping to give some historical marketing perspective. Unfortunately, marketing Assault as an action film was probably a bad idea, despite the fact it does have some exciting sequences. Additionally, there is a gallery of photo stills and work from Carpenter's original storyboards for many key sequences. The final inclusion is an isolated score track, highlighting the now-classic music, which, to the best of my knowledge, is not currently available in any legitimate form on compact disc. Assault on Precinct 13 is an amazing and truly memorable thriller, worthy of discovery. While John Carpenter's career has arguably taken a turn for the worse (I personally think it has a lot to do with the size of the projects and the luxury of a high budget), here he is at his efficient best, and one can easily see the technique and style that would eventually serve him well in future work. A must-see.